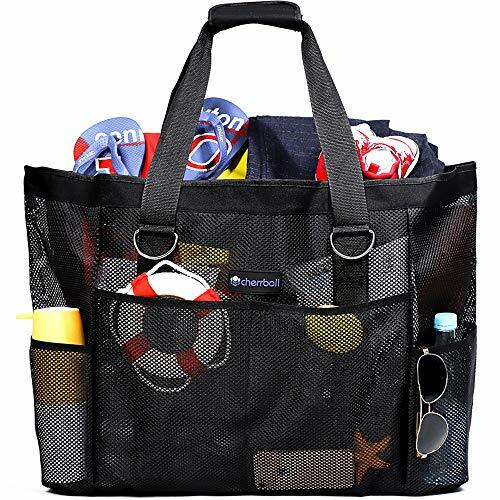 28" Oversized Comfortable Bag - 24L x 8W x 18H inch mesh tote bag allow you to hold everything you need for a day on the beach /pool /waterpark, it can fit 4-6 packs roll towels, toys, sandals, diapers and even has room left! Hose or machine wash. Quick dry. Upgraded Material Avoid Odors - Completed new release on the market! Made of high quality nylon and quick drying mesh to avoid bag odors, foldable & lightweight beach bag can withstand many trips. Strap with pads to prevent any digging into the shoulder. See-thru Body with Solid Base - By being made of mesh you can easily organize beach stuff in it and put the bag under that outdoor shower right the beach to rinse the sand off everything. The bottom has a solid waterproof lining to keep sand out. 8 External Pocket with 1 Inside Pouch - So many separated mesh pockets great for sunscreen, sunglasses, items you wanted to get to easily without digging thru the entire bag while a inside zipper pouch secure you belongs like phone, wallet and keys in a safe place. What You Get - 1 x Cherrboll upgraded beach bag. And every genuine bag comes with lifetime hassle-free warranty, so any questions please contact us first, we will solve the problem perfectly. If you have any questions about this product by cherrboll, contact us by completing and submitting the form below. If you are looking for a specif part number, please include it with your message.